We retraced our steps from the previous day in reverse and headed for Lamar. Right away, things were different than the previous few days: It was actually warm and sunny out! Well, in the 70’s at least. The day wasted no time getting going either, as by the time we stopped for gas in Lamar at about 1:30 Mountain time, storms were firing over the Raton Mesa and heading north-northeast towards us. We headed south out of Lamar towards Springfield as the storms intensified, and were presented with numerous options: one storm well to the west that looked the best near Trinidad, another just west of Pritchett, and a 3rd just west of Boise City, OK. In order to place ourselves in a position to intercept any of them, we headed to Pritchett, stopping just north of town, where we waited to see which storm would become dominant. We weren’t there for long before the storm just to our north took off and started to develop a hook, and soon we had to bolt back north to catch up to it. We headed back towards Lamar and stopped at a rest area about halfway there to take some photos and watch the storm develop. There were actually two cells, and the one in front developed a lowering that was most of the way to the ground while the second one intensified. We headed farther north toward Lamar and by now the storm was a full blown rotating supercell with tremendous structure and that turquoise hue that tells you the hail inside means business. The storm was terrifically striated under a corkscrew updraft, with mammatus and a blocky lowering that was spinning wildly. The storm wrapped up hard and the wall cloud became partially obscured by rain, but soon a cone tornado peaked out (with a little help from contrast-enhancement) and persisted for a minute or two before getting engulfed in the rain again! Tornado #3 for the trip. We watched the storm for as long as we could before the hail core, with baseball-sized stones being reported (and we saw a car with its back window blown out as supporting evidence) threatened to cut our north option off, so we moved out into Lamar and then east towards Granada. The structure as we headed east on Rt. 50 was phenomenal! The storm was now a big striated HP supercell, right turning hard and heading east towards us. We headed south on a dirt road out of Grenada and watched as the storm approached, with a long, linear looking laminar updraft and a wall cloud on the nose end. The rotation of the updraft above us was impressive and the storm was now too big to capture without a wide-angled lens. We were in danger of getting stuck on a muddy road as the storm closed on Grenada and soon the tornado sirens in the town were going off so we headed east on Rt. 50 again to Holly, and then south on Rt. 89. South of Holly, the storm now had a long, linear base trailing off the supercell to the north as multiple cells were now brewing up and the system was becoming a line, but the structure at the north end now had a flying saucer look to it and was still spinning hard. We spend a good half hour watching the storm approach and take pictures, but soon the shelf cloud was practically on top of us and we had to blast south to get out of the way. Another 5 minutes and we would have been pummeled as we stayed there a bit too long. The south end of the line was now taking over anyway and was soon tornado warned, though there was not the slightest sign of rotation in that area of the storm. We narrowly beat the line to Rt. 116, though at this point the line was so thin that you could actually see through to the other side. We headed east into Kansas to stay ahead of the storms. As we headed east, we saw an atomic bomb of convection off to the southeast near Liberal, KS, with a mammoth overshooting top and big back sheared anvil. Once we saw that monster forming, we quickly forgot about the line behind us and bee-lined for the storm, which was already forming a hook. We zoomed through Johnson on Rt. 160 and could see off in the distance the lowered base of the storm that looked to already have a wall cloud developing on it. We had to make a decision: Do we keep going east to get out in front of it, but that would take a long time and while we were passing in front of the precipitation core we would not be able to see what was happening to the wall cloud, or do we head south towards Hugoton and approach the storm from behind, risking being forced to core punch to get to the storm? As we got to Ulysses, we chose the south option since it would get us to the storm quicker and in the worst case if it produced a tornado we’d still be able to see it, albeit from far away. We blasted south along Rt. 25 and got a closer look at the explosive convection going on with the storm. This one was clearly a power house! There were now two distinct lowerings to the south, but then to our east under the updraft of a left-splitting cell there was wild rising motion and an area of white condensation on the group spinning like crazy! The rising motion was almost ridiculously fast, faster than I’ve seen in most tornadoes. The rotation on the group persisted for a minute or so before stopping. One of the only anti-cyclonic tornadoes I’ve seen, and #4 for the tour! Meanwhile, off to our west, we had to keep an eye on the robust shelf cloud from the line of storms we’d left as there were a couple of distinct lowering in that line as well. 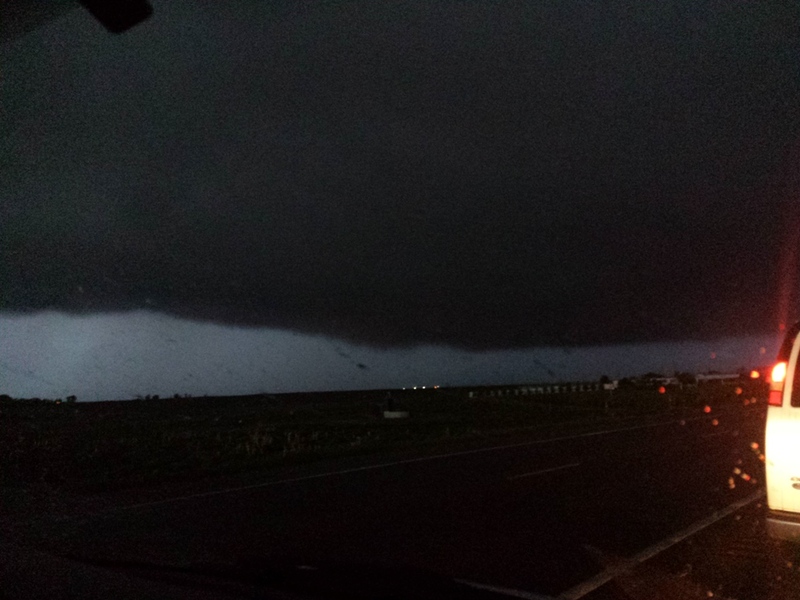 We headed east out of Hugoton on Rt. 51 and were soon coming right up to the two updrafts, one straight to our east and another to the southeast. The structure on the southern cell was fantastic, with a Liberty Bell updraft and a mammatus field under the big back sheared anvil. Both cells had mean looking lowerings and were spinning hard, and as we passed the rear flank of the northern cell just off to our north in the field, the motion was amazing! There looked like there were about 4 areas where we could get a tornado at any time. Time, however, was the problem as it was now getting towards dusk. We got to Rt. 83 and decided to try and get on the southern storm but as we passed by the northern mesocylone we had to stop as it quickly tightened and tried to produce less than half a mile from us! In the near dark it was spooky as the lowering produced several funnels that made it about halfway to the ground that seemed to be getting nearer and nearer to us while inflow screamed into the updraft almost over our heads. We then turned north on Rt. 83 and as the light faded we inched forward on the road with the rotating mesocyclones of the two storms on either side of the van. Still, this was a GREAT chase day, with 3 storms that were better than any I chased in 2014. Tremendous structure and two brief tornadoes, and some great, adrenaline pumping chase moments. Southeast Colorado terrain, south of Lamar. Colorado Green Energy Project near Springfield. First storms of the day near Pritchett, CO. Core opens up just to our north, so we need to backtrack towards Lamar to get in front. Two Buttes in the distance. Rock formations along Rt. 385 south of Lamar. Base of our storm in the distance, front flank core to the right (north). The storm approaches. We were parked just north of the wind farm. Broad base in the foreground but the storm behind it has a low hanging wall cloud and draws our attention. More scrubland flowers. Closer look at the wall cloud. We continued farther north. That storm in front is still impeding our view of the target storm behind it. Better view, but it's raining through the base of the back storm now, hard to see the lowered area well. Time to set up the tripods. Lowering with scud attached. Wider view of the storm. One is a funnel, the other is scud, can you guess which? Driving right along what was becoming a monster high-precipitation supercell. That turquoise glow of a big hail core. Another "action area" developing. This storm has taken over the show, absorbing all of the smaller ones around it. Mammatus clouds on the leading edge of the front flank core. As the core approaches our position, strong rotation in the murk just to our west. Cone tornado emerges from the rain! Closer view. This tornado lasted about 30 seconds to a minute at most. Contrast enhanced. It was hard to confirm that the tornado was on the ground from our location but spotters closer in confirmed it. Soon the wall cloud was engulfed in the big hail core. A look at the vault area of the storm. A few moments later, another funnel on the leading edge. Didn't quite make it all the way down though. Our location (white circle) relative to the storm. Looking right down the "notch", the only way to see anything on an HP storm. First you chase the storm, then the storm chases you! Running east to stay ahead of the beast! Now clear of the town, we get a good view of the huge storm plowing towards us. Striations show that the storm is still rotating violently. That water tower looks lonely... Lightning in the vault region. Plenty of room to spread out and enjoy the magnificent storm. Dwarfing the vans as it's almost time to leave... We almost waited too long! The shelf cloud, big hail and strong straight line winds right behind it, rapidly closing on us as we bolt south. As we headed away from the Lamar storm, another storm exploded near Liberal, KS. As we blasted east, one more look to the west and the low hanging shelf cloud in the distance. Closing on the storm we got a good view of the back sheared anvil of the storm, and a distinct lowering in the distance. As we charged the storm, the left split of the target storm produced a brief tornado just to our east. Note the white vortex on the ground between the left and center sets of wheels, the clouds above were spinning like crazy. We paused to check out the storm as it drifted off to the north. This quickly drew our attention back south! Nice mammatus display! Wide view of the anvil, mammatus, and wall cloud in the distance. 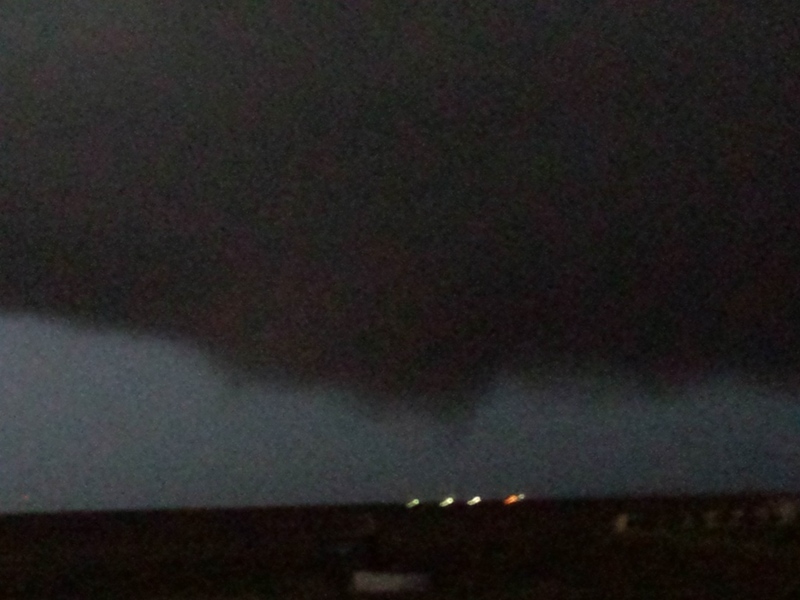 Closing on the wall cloud, several rear flank inflow bands are visible. Brief funnel forms under the wall cloud. Pulled up right alongside a wall cloud to our north, sandwiched in between two storms. Our location (white circle) looking into the notch of the northern storm with another beast just south of us. Note the rotation right overhead! In the fading light the storm north of us was spinning rapidly. large funnel developing. Driving north alongside now, another lowering. We didn't head much farther north in the dark. The storm went on to produce a long-track, large wedge tornado!! Funnel alongside, but soon we had to turn around and make the long drive to Amarillo.